NEWS: Slope Slider, a simpler free version of Math Flyer, is available on the app store! Click "Get it!" With help from the Burroughs Wellcome Fund, the Center for Algebraic Thinking, the Rust Foundation, and the National Science Foundation, the interactive computing power of Shodor is now moving to Apple's ubiquitous mobile devices! Shodor's reputation today as a resource for excellent digital tools for educators springs from our insistence that behind every new teaching gadget should be clear evidence of its effectiveness. We add a new activity to our website only after making sure that it is of high quality and of actual use to teachers and learners. As a result, we have one of the most widely-used educational websites in the Internet for both school and home use. A recent trend in some schools has been the introduction of Apple's mobile devices, such as the iPad and iPod Touch. With their beautiful, intuitive user interfaces and their innovative multi-touch technology, these products show great promise for education. As leaders in education technology, we see clearly the value of putting our innovative software on Apple's innovative hardware. Due to technical incompatibilities, however, we have to rebuild each of our activities from concept. Math Flyer addresses a long-standing gap in Math Education. Traditional education uses static, motionless graphs to indicate the relationships between variables. While this works for some concepts, a student with a function and a picture of a graph gains no intuitive sense of the elements of the function and the relationship of each to the shape of the graph. With Math Flyer, we transform the static world of a graphing calculator into a truly dynamic experience. A student can plot a graph and manipulate all of the variables and constants in that graph, allowing him or her to see the relationships firsthand. 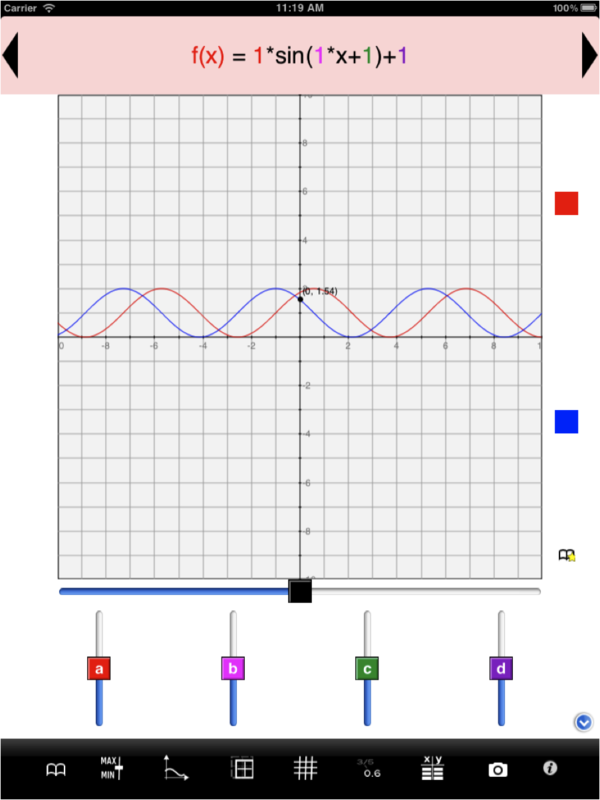 For example, if a student plots "mx+b" within Math Flyer, he or she gets a graph of a straight line, but also two sliders labeled "m" and "b". 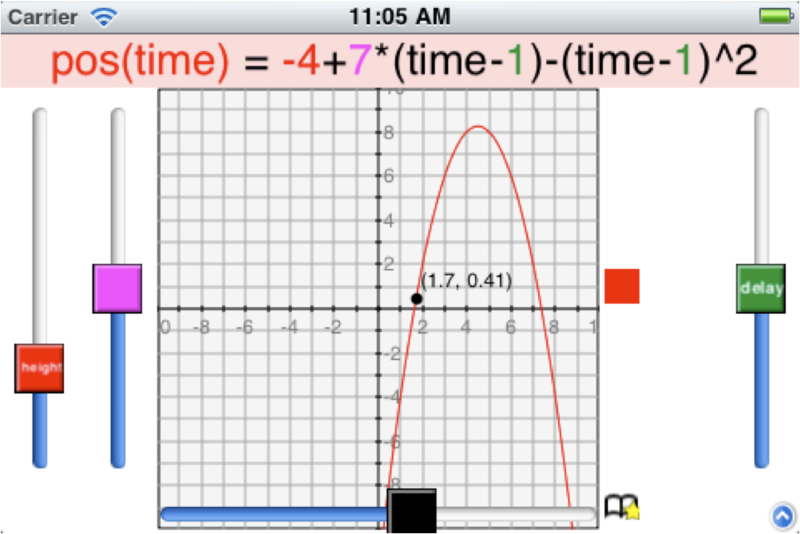 When the student moves these sliders, the graph updates in real time, giving immediate feedback on the role of "m" (the slope of the line, how steep it is) and "b" (the base or y-intercept, that is, the value of y when x=0) in this function. By focusing on the graph and its equation, rather than on the mechanics of plotting a single line, the student more rapidly builds an intuition about the meaning of "m" and "b" in that equation. But graphing lines is only the beginning! Math Flyer plots polynomials, all of the trig functions, exponentials, absolute value, square and saw waves, and so much more. Full advantage is taken of the multi-touch interface so that the user can pan and zoom with the usual one- and two-finger gestures. The user can set his own independent variables, and even use multi-letter variables, so that "pos(time) = 100 + 7*time - time^2" would give a plot showing that the position varies quadratically with time, and the picture would show the parabolic flight of an object thrown off a cliff. The user can then modify 100 and 7 and see the effect on the trajectory. One can also change the function to "pos(time) = height + 7*(time-delay) - (time-delay)^2" and slide how long it takes before the ball is thrown and from what height the ball is thrown. Even into college, students can struggle with understanding the different elements of a quadratic function in this way. With Math Flyer abstract concepts like these become intuitive and easy to understand. This is the true power of interactive computing in math and science education. You can harness the technology to change the function and re-present it. Change a function and re-present it, and it is those re-presentations that enable a student to form a “representation.” Modern math and science learning is dependent on students being able to form these representations. Pattern recognition and characterization are critical skills that will serve a student in the long term much more reliably than will mere symbol manipulation. Math Flyer directly connects the manipulation of symbols with the resulting patterns, encouraging this pattern recognition. Additionally, in Math Flyer's "trace" mode, each function leaves a trail as it changes so that students can see the pattern explicitly before their eyes. As if that weren't enough, there are plenty more features where those came from! The user can take pictures of the graph and save them in the device's photo album, suitable for mailing or printing. A table view shows numerical values of the graph, while the user gets complete control to display all values in either decimal or fraction form. A rich collection of pre-set functions, on-device help, a built-in web browser for viewing related Shodor resources, and of course, full support for Apple's patented touch interface, allow students to tap, pinch, drag, and slide their way to mathematical fluency. Touch devices promise so much, but real dynamic learning has been just a dream. Shodor's Math Flyer makes that dream come true!